Trekking & Safari in Tanzania. Adventure Finder, a new site that helps you find your next outdoorsy adventure. 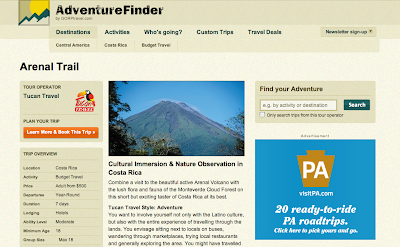 A little like vacation search engines like Travelocity or Expedia, Adventure Finder has a focus on active trips that involve nature and exploring the great outdoors. Choose by destination (Antarctica or Asia? ), activity (areal sports or canyoneering? ), duration, price, or even based on who is going (families or couples? ), and it will show matching results with trip details and information on the travel agency for each trip suggestion. 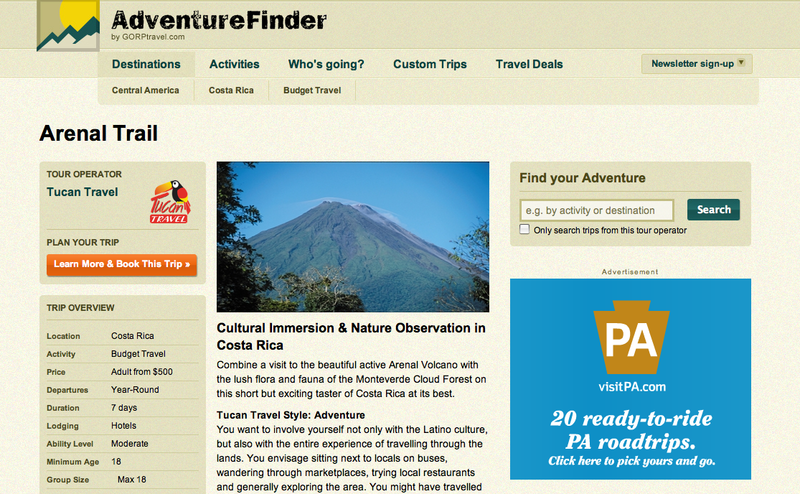 Screenshot of a trip to Costa Rica. There are featured trips and destinations, like trekking and safari in Tanzania, or riding elephants and biking through Thailand. Deals are highlighted by destinations, ranging from 10% off volunteer vacations in Galapagos to saving 35% on wild trekking and cruise in Patagonia. They even list a slew of custom trip operators who will create a one-of-a-kind adventure for you! This adventure one-stop-shop has effectively eliminated the need to google 20 different trip agencies to see which has the lowest price for the exact trip you're looking for. You might even find yourself going for a completely different vacation than what you were looking for. Bon voyage!